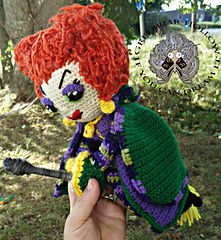 Winifred Sanderson is the eldest of the Sanderson sisters and the one in charge. With her precious Book in hand, she soars through Halloween, looking for the child whose spirit she can steal to restore her life and beauty! 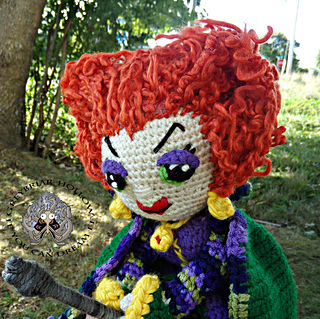 Now you can make your own Winnie, complete with her broom. 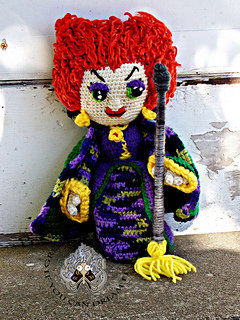 Patterns are coming to make Mary and Sarah Sanderson, Billy the Zombie Butcher and Binx as well Also included is a detailed and easy to follow picture tutorial for making curled hair using dowels and a heat gun.